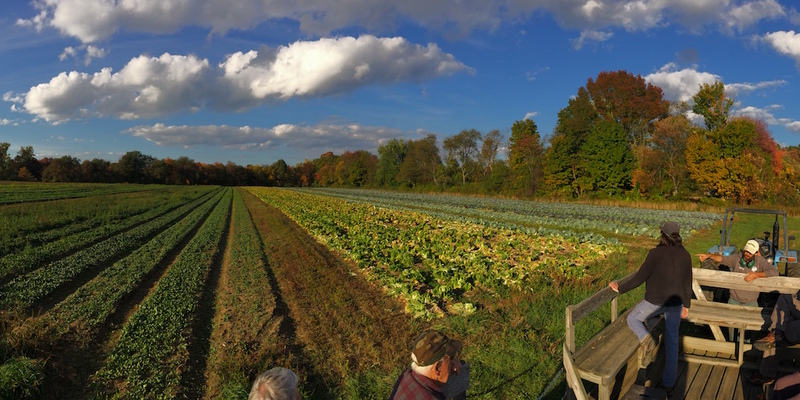 This spring, some of the best soils in the Valley were protected as part of the core operation for Red Fire Farm’s Community Supported Agriculture Farm in Granby, Massachusetts. Kestrel Land Trust purchased the 14 acres of farmland, located on Taylor Street, when it came on the real estate market to be developed as several house lots. Red Fire Farm had been growing vegetables on this land for more than a decade. They could not afford to buy it for house-lot prices, and losing the land would have been a huge loss to the economic viability of this farm and to the thousands of people who buy organic vegetables from Red Fire’s popular Granby farm stand every spring, summer and fall. 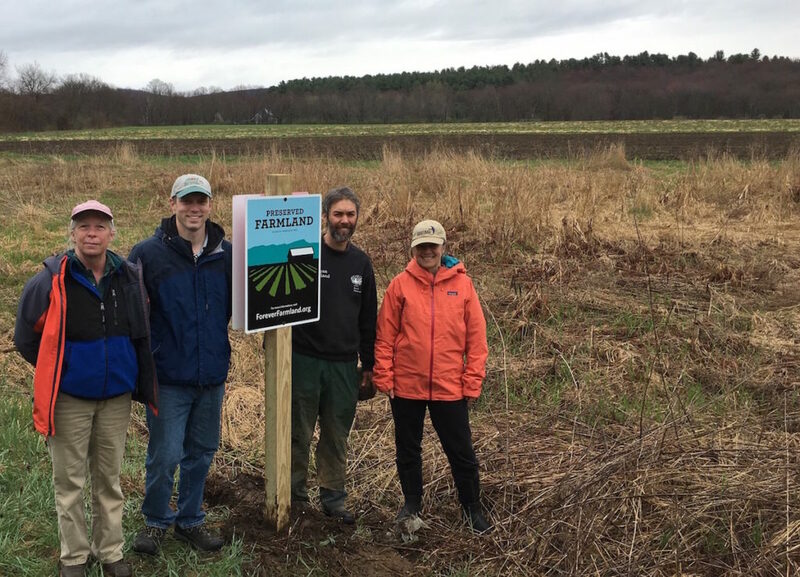 Barbara Hopson and Nick Pitel, MDAR, Ryan Voiland, Red Fire Farm, and Kristin DeBoer, Kestrel Land Trust, celebrated the addition of 14 acres of land with the installation of a Forever Farmland sign. 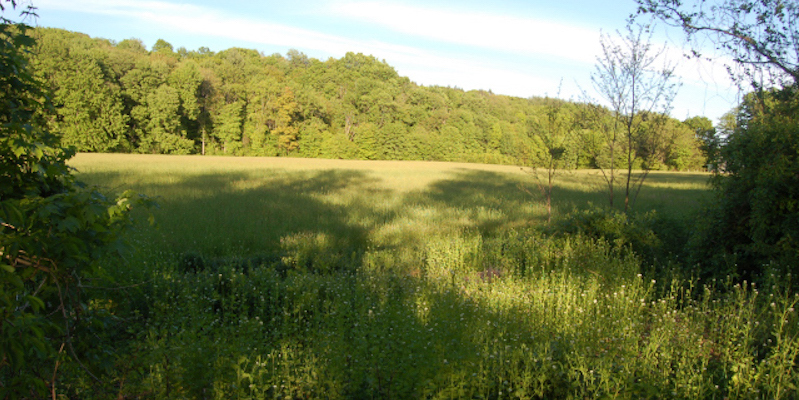 To secure this critical piece of land, Red Fire Farm asked for help from Kestrel Land Trust, a non-profit conservation organization dedicated to protecting farmland and forestland in the heart of the Pioneer Valley. Red Fire Farm now owns the 14-acres, protected with an APR, as an addition to their 50-acre farm down the road on Carver and Taylor Streets. In 2001, Ryan Voiland purchased the original 50 acres from the Hatch/Lyman family. As part of this sale the Commonwealth of Massachusetts also purchased the APR for that farmland, also with the assistance of Kestrel 17 years ago. The land had been fallow for a few years, with some recent use in pumpkins and a distant history as a dairy and potato farm. All of Red Fire’s Granby fields are within the Stony Brook watershed with several branches of the Stony Brook running adjacent to the growing fields. Fields of flat vegetable soils and upland pasture make the farm as picturesque as it is productive. Ryan began his farming career when he was a middle school student living with his parents in Montague, MA, where Red Fire also operates a second farm. With the encouragement and support of his father and mother, he opened a small stand in front of the house where he sold wild berries that he picked. Over the course of high school, Ryan took over and expanded the family garden with plans to grow more vegetables for his farm stand. By the time he reached college, Ryan was renting additional farmland and selling his produce at farmer’s markets and to wholesale customers in addition to the Montague farm stand. After graduating from Cornell University with a degree in fruit and vegetable horticulture in 2000, Ryan pursued his goal of securing a permanent property for his farm business. “We are grateful to Kestrel Land Trust for taking this land off the market, when we couldn’t afford to. Without Kestrel’s help, this land would be growing houses, not food.” – Ryan Voiland, founder of Red Fire Farm. Sarah Voiland, Ryan’s wife, grew up in Stafford Springs CT, one of the most rural parts of that state. As an environmental studies major at Vassar College, she first learned about Community Supported Agriculture when she joined the college sponsored Poughkeepsie Farm Project CSA. Inspired by all of the positive environmental and social change that CSA’s encourage, Sarah decided after graduating that she should become a farmer herself. She started a small community supported agriculture farm called Down to Earth in her hometown of Stafford on the land of a family friend before working at Red Fire Farm in 2007. Sarah now runs the communications side of the farm. 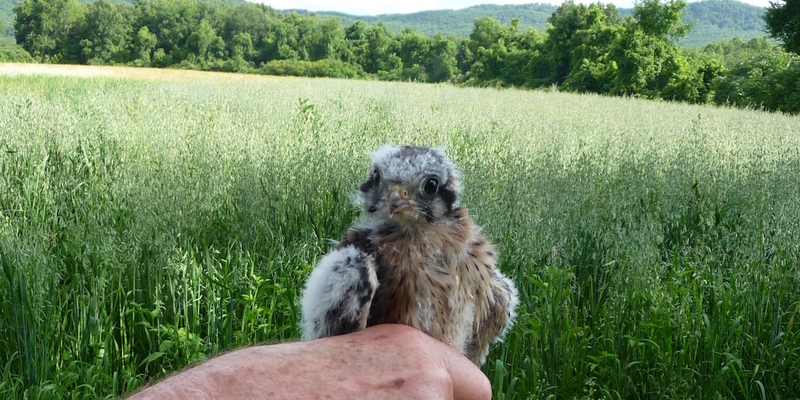 Kestrel bought the farmland with a bridge loan from their financing partner, The Conservation Fund. 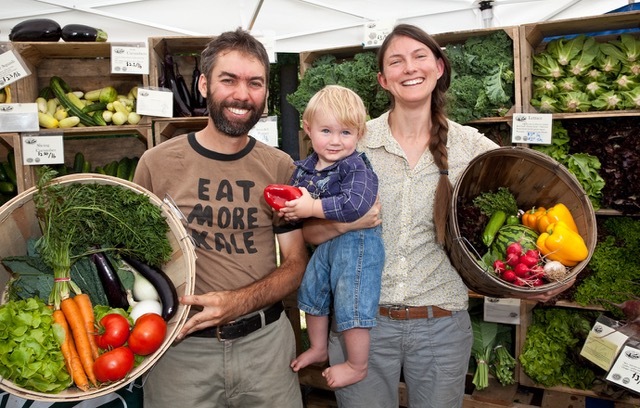 Ryan and Sarah Voiland, owners of Red Fire Farm, with their son. The Massachusetts APR program permanently protects farmland for agriculture while the farmer continues to own and farm the land.  The APR also makes farmland affordable by purchasing the development rights. Kestrel Land Trust and Red Fire Farm celebrated the acquisition and protection of this farmland by placing a Forever Farmland sign on the land on April 30, 2018—the day before Valley Gives Day—a day when people in the community are invited to become Kestrel Land Trust members to support the permanent protection of farmland, as the foundation of a healthy local food system in the Valley.